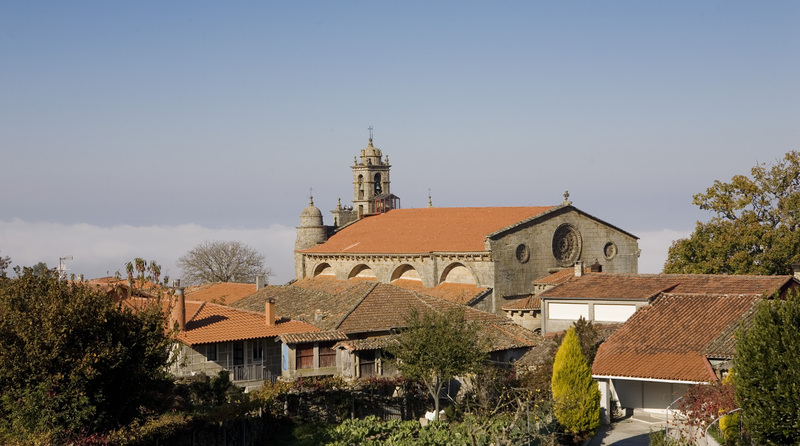 It is not an exaggeration: Santa Mariña de Augas Santas is one of the most mysterious places in Galicia. A fairy tale landscape, legends straddling Christianity and paganism, antique crypts and ruins.. All this comes together in a few square kilometres of this parish of the municipality of Allariz (Ourense). And all of it originates from a story that happened, or so they say, 2,000 years ago. Tradition says that in this place lived, in the second century, the beautiful Mariña, daughter of a Roman governor of Gallaecia who, as such, believed in the gods of the imperial pagan pantheon. But Mariña, influenced by the slave who had raised her, converted to Christianity. Her father, outraged, disowned her. While living far from home, another senior Roman official named Olibrio became infatuated with her. After Mariña’s refusal to give in to his advances, Olibrio tormented and even burned her in an underground oven at the foot of the Armeá fort. Mariña was saved by divine intervention: at the very last moment, Saint Peter used his cane to crack a hole in the roof of the oven for the girl to escape through, only for the Romans to cut off the girls’ head. The head bounced three times on the floor, repeating the word “I believe” and each time causing a spring to sprout. The story is somewhat gruesome, but the good thing for the traveller is that the places of the mythical martyrdom can be visited today just by taking a short stroll from the beautiful church of Santa Mariña de Augas Santas. In the temple, which has a beautiful Romanesque rose window, the relics of the young woman are preserved. Nearby there are several very old and interesting buildings. One of them is the Ourense Bishop’s old summer house of the, which holds the first of the springs attributed to Mariña’s beheading. A second one sprouts behind the church’s chancel. Further down the village is the way to Armeá, a path made with large slabs of stone and surrounded by oaks. Halfway down the path, you will find the most mysterious of these places: the unfinished basilica of Asunción. In the fourteenth century the works on this building stopped and remained incomplete for reasons unknown, although it is attributed to the decline of the order of the Templars, the construction’s developers. Underneath the bare walls hides another secret, not suitable for sensitive hearts: you can access the ‘forno da Santa’, the saint’s oven, a moist and dark crypt in which, according to tradition, Santa Mariña was burned. It is actually a pre-Roman construction, probably a temple or a bath. The path continues through the mountain and passes through the “pioucas da Santa”, the “saint’s puddles”, two rectangular excavations where Mariña freshened up after the torment that were probably old presses to make olive oil. At the end of the route are the Armeá excavations, a fort that must have once been very large.